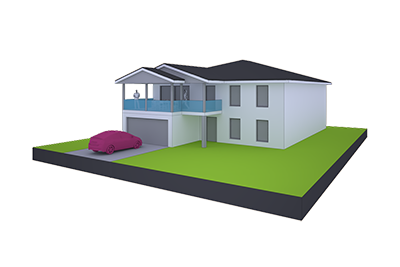 This ( Living areas upstairs ) Double storey home design includes all Living areas + Bedroom 1 positioned upstairs with a large suspended concrete ceramic tile balcony to the front of the house. The foyer & front entry patio are positioned Mid Level to provide quick access to the upstairs Living areas. Also the trip to answer the front door from the Living area level is reduced. This design takes full advantage of any views your home site has to offer, as well as being a first class family residence.